Sakai Community DocumentationSakai 12 Administrator Guide (English) Message Bundle ManagerHow do I customize a default system message? Go to Message Bundle Manager. 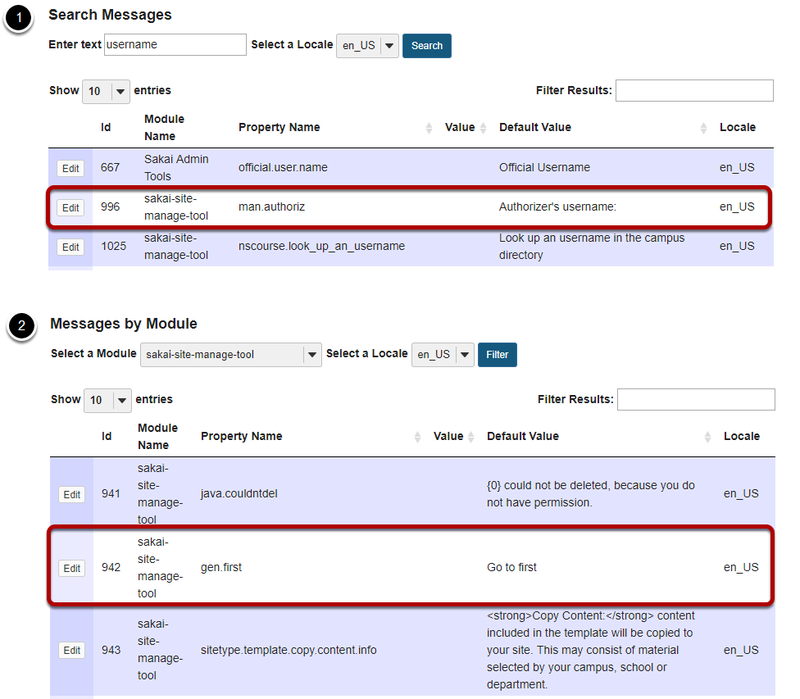 Select the Message Bundle Manager tool from the Tool Menu in the Administration Workspace. Note: If you do not see the Message Bundle Manager tool in the menu, you may need to add it. See How do I add a stealthed tool to a site? for more information on adding a tool to the site. Locate the message that you would like to customize. Zoom: Locate the message that you would like to customize. Enter your custom text into the Value field. Zoom: Enter your custom text into the Value field. The modified message information will be displayed. Notice that the text in the Value field is now different than the text in the Default Value field. Prev: How do I view system messages by module? Next: How do I view and edit modified messages in the system?